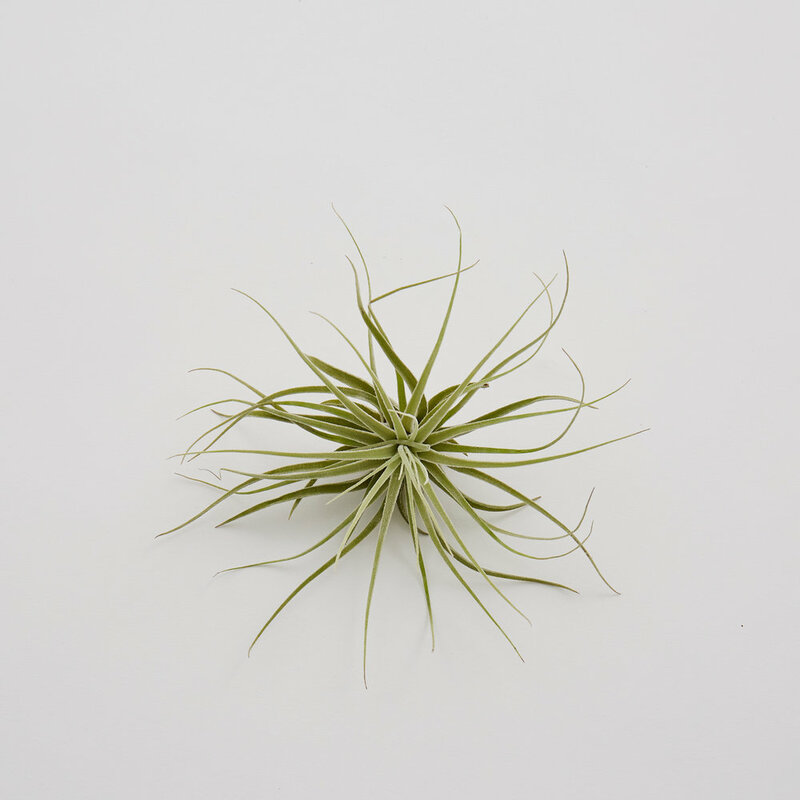 Air Plants, also known as Epiphytes, originate from the hot climate areas in and around Central and South America. They require no soil and instead absorb moisture and nutrients through their leaves from the air. Even though they are wonderfully low maintenance, they still require a different kind of care to your usual house plant. Bright indirect filtered light and away from shady corners is best. Air plants love well lit bathrooms with natural filtered light and humidity. Rain water is preferred, but tap water is just fine. Soak plants for 2-3 hours every week during summer months and every two weeks during winter months. Shake off excess water and dry upside down in a bright well ventilated spot to drain the water and avoid rot. Drying should take 1-3 hours (do not dry in the sun). Dry fully before placing back in your MONTIs. Good air circulation is important. Do not place air plants in air tight containers. Avoid heaters, radiators or heavily air conditioned rooms these will dry them out. When your air plant arrives soak it for a couple of hours - post is thirsty work! Fully submerge plants in a bowl or sink of water for 2-3 hours shake excess water and leave to dry upside down. Spray mist in between each soaking. So simple! Is my air plant OK? The leaf tips have turned brown, crispy and are starting to curl - a sign of under watering and/or too much heat or direct sunlight. Give your air plant a bath and move away from heat. The base of the plant has turned black/brown and leaves are falling out from centre of the plant - this is a sign of rot due to overwatering. Each air plant blooms differently and at different times depending on the species, care and environment. This cycle can last days or months (if you're really lucky!) and each plant has a different type and colour of flower. Prune your plants by trimming any brown tips on leaves and peeling away any loose bottoms leaves. Growth is much slower than normal houseplants so to encourage bloom and pup production, introduce orchid or bromeliad fertiliser once a month. During the bloom cycle try not to water the flower but instead spray the leaves until fully moistened.